This is probably the hardest bronze problem we&apos;ve asked all season, befitting the fact that it&apos;s on the US Open contest (for which there is a longer time limit). It takes a good bit of thought to figure out the right solution structure, after which coding isn&apos;t too bad. I&apos;ll go through a couple of solution ideas in detail below. Hopefully you found this and the other bronze problems fun and challenging this season! In other words, we have a population with just trait A, a population with just trait B, and a population with both. 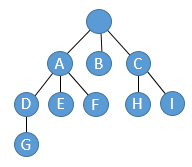 If we want to build a tree out of this input, we would need to split on either A or B at the root, but then the remaining two subtrees would both need to have an edge that adds the other characteristic. For example, if the root split into "A" and "not A" branches, then both branches would need to contain an edge that adds the "B" trait. A tree like this is easy to convert into a proper evolutionary tree. E.g., if we have three children A, B, and C, we could just make three sequential two-way splits that add the A, B and C characteristics. So, at the end of the day, we actually don&apos;t need to build a proper evolutionary tree, but we just need to test of any of our characteristics represent crossing sets; if so (and only if so), a proper tree is impossible to build. This leads to probably the easiest solution of the problem, shown in my code below where I build all the sets of populations having each characteristic and then just test if any pair of these sets is crossing. Below this code, I&apos;ll discuss an alternate solution that also solves the problem and also builds the tree (if possible). // Do two sets "cross" -- I.e., are there elements in A, B, and A intersect B? This means the "+A" edge in the tree (the edge adding trait A) cannot be an ancestor of the "+B" edge, since otherwise every population with the B trait would also have the A trait, contradicting the observation that the size of set A above is smaller than that of B. In general, this means splits on traits involving large sets of populations happen higher in the tree, and in particular the split at the root has to involve the trait with the largest sized set (the set having the most populations). A method for building the tree therefore is to split on the largest trait, thereby dividing the populations into two groups, and then continuing to divide these groups the same way, always splitting on the largest available trait. If there is ever a tie for the largest trait (say, between traits A and B), some careful thought will convince you that either A or B would be suitable for the split at the root (this is clear if A and B are disjoint, and if A and B are crossing we will get into trouble later no matter what; A and B cannot be nesting if they have the same size). If we ever end up adding the same trait in two different places in the tree, we know that building a proper tree was not possible. Finally, sorting within each block on the last digit makes everything sorted. Then each population is expressed as a binary number whose 1s and 0s reflect its traits. Now sorting these binary numbers the same way as above ends up basically running the tree construction approach we just described. We first sort on the leading digit, which separates the populations having trait A (the largest trait that we wanted to split on at the root) from those not having trait A. Then we split those groups on the second largest trait, and so on. So building the tree is much like sorting if we look at it from this perspective. Note that this problem is directly applicable to real-world problems facing evolutionary biologists in terms of figuring out the most likely way organisms evolved in the past. The tree structure we are building is often called a "phylogenetic" tree in this area of study.